"Hello! Hello!" Hands wave and ready smiles flash as curious pedestrians leave it to the last exasperated beef of the horn to adroitly step off the main thoroughfare. Double and triple rows of immaculate school children riding abreast on bicycles, the odd regiment of ducks marching to wards the field in military precision, event religious processions that stretch for miles, all are common road hazards in Bali, not to mention those lazy, indolent dogs that seem to think the main street is for sunning. Over 100 distinct ethnic groups exist within Indonesia, each with its own culture and tradition, not to mention the 300 odd different languages that are spoken. From this basis has evolved a diverse range of religious customs and traditional law so varied as to be overwhelming. Indonesia is proud of its great diversity of cultures and languages, symbolized in the state motto 'Bhinneka Tunggal Ika' which means Unity in Diversity. destinations in Indonesia. Your travel agents in Bali are ready with any number of tour extensions to seldom visited corners of the archipelago, opening the door to adventurous travel with the most convenient and comfortable arrangements available to see Bali more in side with taste authentic Balinese and to touch their daily life tradition. - Transfer Airport-hotel-airport and our transport all withair-conditioned. - With guide speaks English or others languages on request. - Entrance fee in some places. - Cold mineral water in the car. - Ubud, Lovina and Candidasa. - A room for two people with Air-conditioned and private bathroom with hot water in Superior class. - All accommodation with swimming pool. The hotel is very good, with the quality of their services. We been working many times with them, so far all our clients enjoyed very much. - Transfer Airport-hotel-airport and our transport all with air-conditioned. - A room for two people with Air-conditioned and private bathroom with hot water. Singapadu: Here we will visit "The traditional House of Bali". The structure of the house in old tradition. With the calm simplicity of their small houses, their daily life and their animals you would feel culture of Bali. Tohpati Village: the centre textile traditional, with great variety and qualities of Batik (clothes is obtained by the procedure of having part of the material with wax, to put the colours and to quite the wax). The part with waxed is not coloured, and the one original genuine pace put the colours, as on originates a drawing. The batik is a handmade technique of Java, but the Balinese also do its. Puri Saren: this village in Ubud centre, we will have look a bright gold colours Palace in Balinese style building. With its beautiful tropical garden. Here live the family of King who has powered in this region during before we have presidents. Ubud: This charming city, surrounded by rice fields and without a doubt destination, the most popular on the interior of Bali, and also the gratify. None only Ubud is fresher than the coastal areas but its has a great wealth of cultural activities and opportunities to go for a walk around the fields of the surroundings, to go shopping or, simply to relax. We can try the Babi Guling (suckling pig) here. There are good restaurants and a varieties establishment of the hotel with the exclusive standard in the island. Also it is necessary to discover the village a long the streets to find something of Interest. Candi Kuning Market: In here where the local people sell their local natural product such as , tropical fruits, vegetables, spices and flowers and also local handcrafts. Very good place to taste and to learn varieties of local natural tropical fresh product. Lake Beratan: This is a beautiful view to the hills, a recreational park, fresh temperature, in order tropical botanical garden, colourfully flowers with the lake of Beratan and its lake temple was built in 1634, for the God of the Lake (God of the fertility of the farmers). It's located in the village of Candi Kuning, in district of Baturiti and region of Tabanan. This is the second great lake in Bali (among of fours lake, the lake Batur is the biggest). In here we can make pictures with the snakes and giant bat. Mount Catur forest: The forest with hundreds of monkeys near by the Lake Buyan. It's wonderful views of the lake, fields and villages. We can buy the food for friendly families of monkeys and take photos with them. Before have breakfast at 05.00 we go to sail or by Perahu (small colour traditional bout) to admire the dolphins jumping in front of our perahu, also to wonder the Balinese sun rise with the view of the palms trees and the mountain. Kintamani: Place to wonder the active volcano, the mountain and the lake Batur with their crater and the landscapes in around. This volcano had eruption in 1917 another in 1926/7 and other 1963. Large of black lava on the valley of the crater with the largest lake in Bali with great view as far as your eyes can see. This village is called Penelokan, in the district of Kintamani and region of Bangli, it has a height 1500 meters of the sea level, being the quite fresh temperatures. The sacred temple "Besakih" located in the feet of the mount Agung in the village of Besakih, Rendang district and the region of Karangasem. This temple dedicated a Sang Hyang Widhi Wasa, the Supreme God. For that reason, this temple they are called '' the temple Mother". 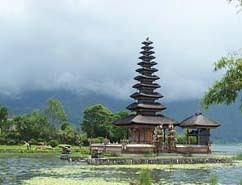 (the biggest in Bali) of those among 300.000 temples that exist in Bali. It was built in VIII century by Priest Markandia, a priest was came from the island of Java. Until arriving there we will be surprised beauty of the spectacular landscape and agricultures. Bukit Jambul: When going toward Bukit Jambul on left - right side of the road there are many beautiful terraces of rice and it is ascended by the fresh and humid mountainous region. There are several places where it can eat up and where we can wonder beautiful views of the small island of Nusa Penida on crystal blue ocean. Klungkung: Here is the Kerta gosa "Palace of Justice", with beautifully painting decoration on ceiling of the building native from the history and culture of Hindu Bali, this Palace of justice is built inside of the moat (Floating Pavilion). Sponsored by the local noblemen from region of Klungkung, with It museum complete with local fine arts handcrafts product collection. Kusamba: Picturesque Prahus (colours traditional boats) on the dark sandy beach in Kusamba fishing village, with good views to the island Nusa Penida. At night when sea is in calm, there are many prahus with the white candles on this narrow strait among the two islands (Bali - Nusa Penida), one Perahu normally managed by five men, another business from the local villagers on the oriental coast is making salt on their traditional way. There are small cabins where manufacture the salt. The salty water is picked up from the sea for watering the black sand along the beach. After dry, the farmers will collect top path of the sand for sea water filter in a great recipient inside the cabin. Slowly they collect the pure water with high content of salt, for dried by the natural sun shine on block of the sallow wooden boxes then being crystal of salt. The whole process takes one day till two days defend on the sun. Candi Dasa: It was a calm small fishing village, but since five years ago, it built with a dozen of losmen (house to stay), hotels and restaurants, and many travellers prefer Candidasa, calmer than Kuta, cheaper than Sanur, and the best place to stay and to explore the oriental part of Bali. It is especially popular among the submarines but the main problem is the beach has erosion as quickly as the new hotels were built. We will overnight in Candidasa Bungalows. Tenganan: It is one of the oldest villages in Bali; it's called "Bali Aga" the Balinese "original". It is a walled village which all the housings have an identical structure and they are prepared in lines to both sides of wide and paved streets. Tenganan possesses cultivated lands. They believe that their adat, or customary law, and they have protected the spiritual purity of their realm by an iron-clad obedience to their Adat for many centuries. Traditionally, the women of this village knit the famous mantel "Gringsing", weaving clothing is used for ceremony dresses. Pelihatan: This village, near Ubud, is a village of painters. The Balinese paintings have been famous with four groups or styles: the classic paintings / the oldest or traditional paintings, the paintings that mix the old and new styles, the paintings modern elements that often are strained in their drawings and nife style. It is spread of art galleries. All side of road or alley seems to be a favourable place to exhibit the "works of art" that vary varies in price and quality. Wooden Carving village, Mas: In this village 85% from them work on the wood (good quality of the wood carving), the carver select their wooden block and then they carve the rough form by an axe, with a mallet and dozens of small chisels. The detail wood carving is also carved with delicate forms by the Balinese artist. They are made from ebony wooden, mahogany, sandalwood, teak and other local wood. This town is in the district Ubud, region of Gianyar. Celuk Village: A village with about 80% from the people work as gold and silver smite, their works in detail brilliant decorate with filigree and its precious stone. They are sold with reasonable prices. This village is in district of Sukawati and region of Gianyar. Tanah Lot: From the entire temple in Bali, the most popular is Tanah Lot temple, the well known and photographed place in Bali. The temple, located in a small rocky island, it is magnify, so much smoothly illuminated on day light of the sun dawn or profiled at dark. It is very touristy with the group visitors, especially in the sunset time.